WINTER HAVEN - A "credible tip" related to a missing-persons case has Winter Haven police digging in an orange grove off Sage Road in northeast Winter Haven. Police disclosed during a Wednesday afternoon press conference that human remains were found in the grove, but they haven't determined their race or gender. The tip involves the case of Ronkeya Holmes, 29, and her daughter, Masarah Ross, 3, who have been missing since October 2009, according to police spokeswoman Jamie Brown. The tip, Brown said, suggested that the bodies of the mother and daughter could be found buried in the grove. Some digging by authorities took place at the orange grove site late Tuesday afternoon and continued Wednesday. Lester Ross, the girl's father, is a "person of interest" in the case but not a suspect, Brown said. Ross, 32, was arrested by the Polk County Sheriff's Office on Friday and booked into the Polk County Jail on unrelated charges of grand theft and nonsupport of children or spouse. He was released from jail Tuesday. Winter Haven Police Chief Gary Hester and officials with the Florida Department of Law Enforcement (FDLE) talked about the law enforcement activity during the 2 p.m. news conference at the grove. City police and the FDLE are being assisted in this investigation by the Sheriff's Office and its crime-scene technicians. Sage Road runs north off Dundee Road and leads to an animal shelter run by the Humane Society of Polk County Inc.
WINTER HAVEN -- The search for a missing mother and daughter led to the discovery of a shallow grave with skeletal remains in a Winter Haven orange grove and an arrest of the girl's father Wednesday afternoon. Winter Haven Police, the Polk Sheriff's Office and the FDLE were acting on a 'credible tip' that turned out to be from Sharon Ross, the wife of the man police believe murdered Ronyeka Holmes, 29, and her young daughter Masarah Ross. The mother and daughter went missing in Dec. of last year. Investigators say Holmes was desperately trying to get her daughter back from the child's father, Lester Ross, and was also questioning where their daughter was. In Oct., police searched for the bodies of the mother and daughter at Ross' former home. That dig turned up no evidence. Ross told police he last saw Holmes and Masarah Ross at a local Walmart, but surveillance tapes, according to police, revealed the two were never there. Ross was caring for his daughter in the summer of 2009, while her mother attended school in Georgia. Holmes disappeared around the time she was supposed to meet with her husband to exchange custody for their daughter. Officers first arrested Lester Ross on unrelated charges Friday and then later re-arrested him Wednesday for tampering with a witness, a first-degree felony. Police say the latest charge is related to the case. Winter Haven Police Chief Gary Hester said they had a reason to re-arrest Ross. "It's based on him attempting to intimidate a witness in this case," he said. That witness turned out to be Ross' wife, Sharon. In an interview, Ross' wife told police she came home in May of 2009 and found the little girl dead, which her husband told her was an accident. She stated her husband kept his daughter's body in a deep freezer in their home for several months. Then in Oct., she said she witnessed Ross load two items into the trunk of a car that he appeared to be struggling or straining to carry. His wife said he then directed her to drive to an orange grove off of Dundee Rd. in Winter Haven. When they got home, Ross allegedly wrapped a power cord around his wife's neck and told her if she ever told anyone about what happened, he would kill her. Ross consented to a polygraph test when he was first questioned about the disappearance of his daughter and her mother, but then left before completing it. The reason he is charged with witness tampering is the alleged cord assault and threat that prevented his wife from going to police. Ross left the Winter Haven Police Department Wednesday night, saying he did not murder his 3-year-old daughter or her mother. On Thursday, Ross appeared before a Polk County judge for the witness tampering charge, but investigators also believe he is responsible for the murder of Holmes and her daughter. Officials are waiting to finish the investigation before Ross could potentially be charged with murder, which means waiting on the autopsy reports to come back. On Wednesday, acting on the tip authorities used ground-penetrating radar and cadaver dogs after receiving the tip that Holmes and her 3-year-old daughter may be buried in the orange grove near Dundee Road and Sage Road. Later Wednesday afternoon, it was determined the remains were that of an adult and child. Although it hasn't been confirmed, Hester suspects the remains belong to the missing mother and child. "There's two sets of skeletal remains in the same shallow grave." he said, "It's pretty apparent this is our little girl and her mama." Hester said he's now working a murder investigation. "It's obvious folks just don't end up in a grove by natural means," he said. "It's a bittersweet day. We wish we would've found these folks alive." Again, the remains found are that of an adult and a child, but have still not been positively identified as Holmes and Ross. Forensics experts are now trying to determine the gender, race, and age of the remains found. Ronkeya Holmes' family showed up to the scene and talked about hoping for closure. "Some nights, can't sleep," said her stepfather, Archie Forte. "You wonder why it happened." Family friend Diamond Burnham was also hoping for closure. "The family will not be happy but the mom will be able to sleep knowing that her child has been found," she said. Leon Forte is the brother of Holmes's stepfather, Archie. Forte believes Ross has to know something. "I want them to get to the bottom of it, find out something, what happened, because she was a good girl," he said. WINTER HAVEN -- Lester M. Ross Jr. hasn't yet been charged directly with the fall 2009 disappearance of his young daughter and the little girl's mother, but police investigators now think he's the person responsible for it. Based on police work thus far in the missing-persons case and incriminating new statements by Ross' wife, Sharon, "investigators believe that Lester M. Ross Jr. murdered Ronkeya Holmes to hide the fact that Masaraha Ross was dead and to avoid any criminal charges" related to the child's death. That summary is included in a Florida Department of Law Enforcement (FDLE) arrest warrant naming Lester Ross and charging him with tampering with or harassing a witness in connection with the missing-persons case. Winter Haven police released the warrant Thursday, a day after they said they had unearthed the skeletal remains of two people, an adult and a child believed to be Holmes and Masaraha Ross, in an orange grove off Sage Road in northeast Winter Haven. The warrant includes statements by Sharon Ross that she was with her husband on Oct. 20, 2009, when Lester Ross drove a rental vehicle to an orange grove near Dundee Road -- Sage Road runs north off Dundee Road -- removed two sheet-covered items from the trunk of vehicle, went into the grove with the items and returned later without the items. Holmes, 29, and her daughter, Masaraha, then 2 1/2 years old, were reported missing on Oct. 20, 2009, by Holmes' mother and sister. Lester Ross, 32, of 703 Hemenway Drive, N.E., Winter Haven, was arrested on the witness-tampering charge at about 6 p.m. Wednesday and, following a court appearance Thursday afternoon, now sits without bail in the Central County Jail in Bartow. In a Monday interview with investigators, Sharon Ross stated "that she believed that Lester M. Ross Jr. kept the body of Masaraha Ross in a deep freezer in their residence for several months, never notifying law enforcement of the child's death," according to the FDLE's arrest warrant. Sharon Ross stated that her husband told her that Masaraha's death at their home in Winter Haven was an accident. Police had been told that Lester Ross had been caring for Masaraha over the summer of 2009 while her mother was finishing classes at a technical school in Georgia. On Oct. 14, 2009, Holmes traveled from Georgia to Winter Haven to pick up her daughter and bring her home, police reported. Police were told that Holmes and Lester Ross were supposed to meet at the Walmart in Haines City for a child exchange. According to the arrest warrant, police also were told that Holmes had been having trouble contacting her daughter's father, "and when she did contact him, he would always say that Masaraha was with someone else." According to the warrant, Sharon Ross stated that on Oct. 20, 2009, after she had come home from work, her husband made her stay in the rental vehicle she was driving. Sharon Ross said she saw her husband load into the trunk of a rental car "two items, each wrapped in sheets, and that it appeared to her that Lester M. Ross Jr. was struggling and/or straining to carry the items to the trunk." Sharon Ross told investigators that she and her husband then went to the orange grove off Dundee Road and that they left the grove without the items that had been put into the trunk. According to the warrant, Sharon Ross stated that after she and her husband returned from the grove, he "wrapped a power cord for a cellular telephone around (her) neck and told her that if she ever told anybody about what happened, that he would kill her." The warrant states that based on Sharon Ross' statements and directions to the orange grove that she provided, law enforcement located the skeletal remains of an adult and a child in a shallow grave. A forensic investigation of the remains will be undertaken to determine whether the human remains found in the grove actually are those of Holmes and Masaraha. "We certainly have not been able to confirm the identity, which will take the work of the medical examiner, the pathologist and the lab results," Winter Haven Police Chief Gary Hester said Wednesday afternoon at the grove. "But based on what we've found, it leads us to believe we have found the little girl, Masaraha, and her mother Ronkeya." David Waller, the resident agent in charge of the FDLE's Lakeland field office, said "It could be weeks or months to get (the patholothy) results." In the meantime, Lester Ross Jr. will remain in the Polk County Jail -- without the chance to post bail. WINTER HAVEN - The man investigators think is behind the disappearance of a mother and daughter in Polk County faced a judge Thursday afternoon. Lester Ross has been charged with witness tampering. He is the father of 3-year-old Masarah Ross, who went missing with her mother, 29-year-old Ronkeya Holmes, more than a year ago. While Ross appeared in court, investigators were back out at the orange grove off Dundee and Sage Roads where human remains were found on Wednesday, looking for more evidence. Police are almost certain that those bones belong to Holmes and her daughter though they have not been positively identified yet. Holmes and Masarah Ross disappeared in October 2009. Lester Ross, who had been engaged in a custody battle with Holmes at the time, told police he last saw them at a Haines City Walmart. Earlier this week, police received "credible information" that there was evidence relating to the disappearance in that orange grove. WINTERHAVEN, FL (WTOC) - Police have released new details in the dissapearance of a three-year-old girl and her mother from Savannah. According to an arrest warrant from Polk County, FL, Winterhaven police say that Lester Ross, Jr. kept his three-year-old daughter Masaraha in a freezer after he strangled her. Ross's wife, Sharon Ross, told police on December 20, 2010 that in May 2009 she left Masaraha alone with Lester Ross and when she returned she found Masaraha dead. Lester Ross told Sharon Ross that her death was an accident. Sharon said that Lester kept Masaraha's body in a deep freezer at their home for several months and never contacted authorities. According to the arrest warrant, Sharon also told authorities she witnessed Lester Ross struggle to load two items, each wrapped in a sheet into the trunk of her rental car. Sharon stated that Lester made her drive the car to an orange grove. When they reached the destination, Lester removed the items from the car and he returned several minutes later empty handed. Lester made Sharon drive back to their home and when they arrived he wrapped a cell phone cord around Sharon's neck and told her that if she ever told anyone about what had just happened, he would kill her. Based on Sharon's description of the orange grove, authorities were able to locate the skeletal remains of an adult and a child in a shallow grave. 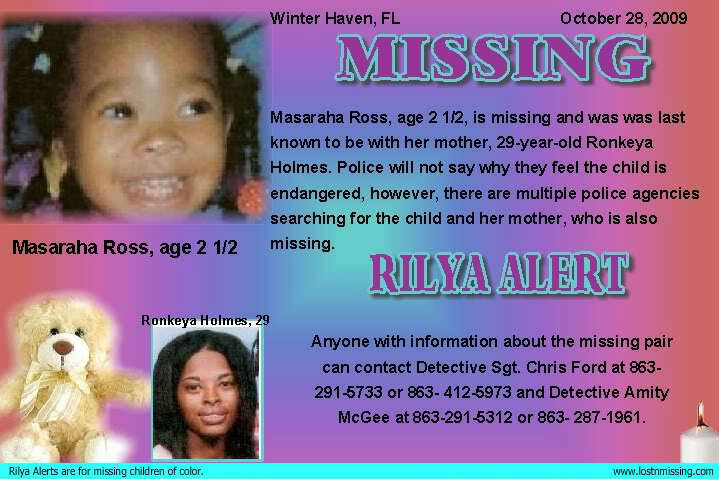 Masaraha's and her mother, Ronkeya Holmes, were reported missing on October 20, 2009. On October 14, 2009 Ronkeya traveled from her home in Savannah, GA to Winterhaven, FL to pick up Masaraha. Lester Ross was caring for Masaraha while Ronkeya finished technical college. According to the arrest affidavit, Ronkeya told family members on October 18, that she was meeting Lester at Wal-mart to pick up Masaraha. Family members stated to authorities that Ronkeya said she was having difficulties meeting up Lester and that as soon as she picked up her daughter she would be going back to Savannah. Ronkeya's aunt says that she saw Ronkeya logged into Facebook in the morning hours of October 19. Her aunt said she tried to message her, but got no response. After a subpeona from police, Facebook says her account was active from 11:46 p.m. on October 18 until 12:08 a.m. on October 19. Facebook reported to authorities that the IP address traced back to Lester's house. Police report that Ronkeya made several calls to her family from her cell phone on October 20 to try and get her vehicle out of the Seminole County impound. Her family reports that she sounded stressed and that when they offered to come get her she would hang up. Tuesday, October 20, 2009 was the last time anyone heard from Ronkeya. Police say they believe Lester Ross killed Ronkeya Holmes to hide the fact that Masaraha was dead. Police are awaiting an autopsy report to charge Lester Ross with their deaths. Lester Ross is currently being charged with tampering with or harrasing a witness. Winter Haven, Florida - New details are being released in the case of a mother and her daughter who went missing out of Polk County last year. 29-year-old Ronkeya Holmes and her 3-year-old daughter Masaraha went missing in October of 2009. Six months earlier Ronkeya left Masaraha with the girl's father Lester Ross, who was living in Winter Haven with his wife Sharon. Ronkeya left her child with Ross so she could focus on her early Early Childhood Care and Education classes at Savannah Technical College in Savannah, Georgia. When her classes ended she tried to get her daughter back, but family members say Ross gave her the run-around repeatedly. Ross told investigators that he handed his daughter over to Ronkeya on October 18 at a Walmart in Haines City, but police say they've never been able to locate surveillance video to support the claim. Winter Haven police say Ross continues to maintain that he hasn't seen or heard from either of them since that day. But in an arrest warrant for Lester Ross, his wife Sharon tells a different story to Winter Haven police. She says she came home on May 28 of 2009 and found Masaraha Ross dead at their home at 703 Hemenway Drive NE in Winter Haven. Sharon Ross says Lester told her Masaraha's death was an accident. She told detectives she believed that he kept the child's body in a deep freezer in their home for several months without ever notifying law enforcement. She also says that on October 20 of 2009 she came home from work and Lester made her stay in the vehicle as he loaded two items into the trunk of the vehicle. She says it appeared he was struggling or straining and that the items were wrapped in sheets. She says Lester then directed her to drive to an orange grove off Dundee Road in Winter Haven. She says she pulled up and parked next to a telephone pole adjacent to the orange grove. Sharon claims Lester removed the items from the trunk and carried them into the grove before returning to the vehicle. She says after they arrived at home Lester wrapped a cord around her neck and told her if she ever told anybody about what happened, that he would kill her. Based on the statements of Sharon Ross, evidence technicians and detectives conducted a dig for the missing mother and daughter's remains on December 21st and 22nd. Winter Haven police say they found skeleton remains of an adult and a child in a shallow grave in the orange grove in the location that Sharon described. Winter Haven police say they believe that Lester Ross murdered Ronkeya Holmes to hide the fact that Masaraha was dead and to avoid facing any criminal charges. Meanwhile, an autopsy is being performed to officially determine the identification of the remains that were found and how the two people died. Lester Ross remains in jail. At this time he is facing a tampering with or harassing a witness charge, which is a felony. He could face additional charges once the remains are identified. Lester Ross was also recently arrested for two misdemeanor charges. Monday evening Ronkeya's mother, Edith Fletcher, reacted to the allegations in the arrest warrant. She says, "The baby was in the freezer. That's the hardest part in the world to really believe. You can't even see that. Imagine that. It's like a horror story." Fletcher adds, "I think my heart goes out so bad for the baby. To know you can kill your own daughter and put her in the freezer for that length of time." She says she believes Lester killed the little girl and lied to Ronkeya by always saying the baby was sleeping or out of town. Fletcher thinks Ronkeya finally put her foot down and started asking questions and that's when she thinks Lester decided to kill her too. Fletcher isn't sure whether she believes Masaraha's death was an accident but says she wishes Sharon Ross would have come forward sooner. She feels that she's at fault too. "I just hope God has mercy on both of them because if you waited this long you are just as much at fault as he is."